She's on the job. On Duty. And ready for the action. She's the cool cop! 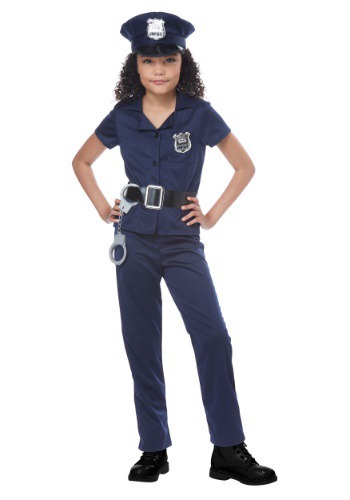 This Cool Cop Costume for girls will turn any little lady into a police officer. Law enforcement is a noble occupation, and having a great police department is super important to maintaining public safety. So we're really glad your girl is joining up! She'll be the perfect addition to the squad. All she'll need is this authentic looking costume, and she'll be ready to serve and protect! And that's what we've got ready for her, right here, with this Cool Cop Costume. This basic girl's costume has all the gear from an official police uniform, but it's ready for the costume fun on Halloween or for when she's busy playing an epic game of cops and robbers. Matching navy top and pants are styled just like a uniform, and the coordinating hat completes the theme. A badge attaches to both the chest and hat to make it look super official, and it even comes with a belt and prop handcuffs if she has to go on duty! 100 percent polyester, the top secures with front buttons, and the pants have an elastic waist for fit. Whether it's imaginary fun or if she really wants to grow up to be a cool cop, this costume will give her the threads to bring it to life. Go cool cop, go!